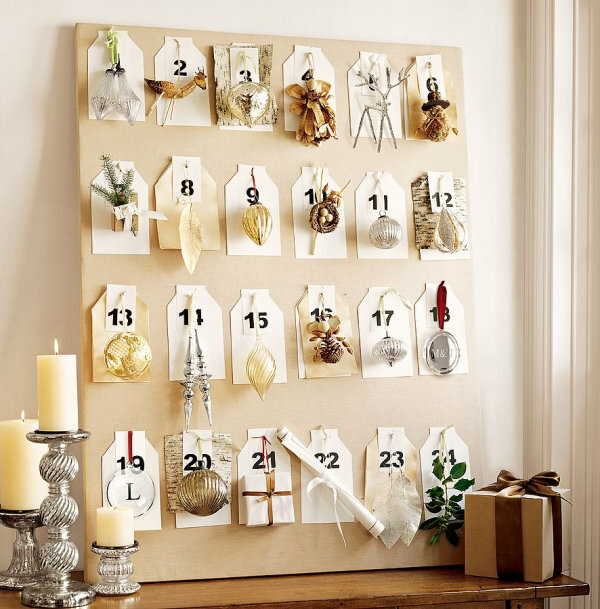 Today we feature 10 DIY advent calendars to make with the kids. As a companion piece to our recent post on DIY advent calendars, we now present another round up to inspire you in your last-minute calendar endeavors. And no, it’s not too late to jump on the bandwagon! 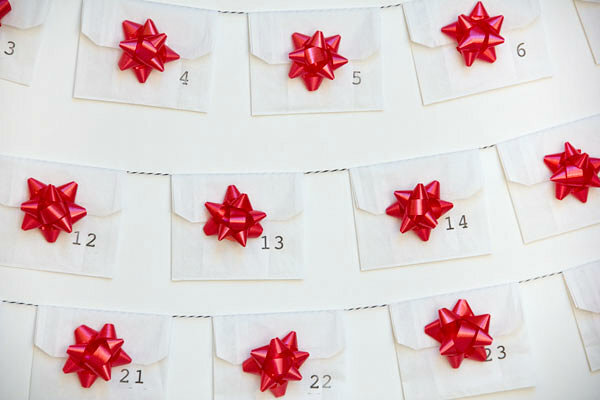 These advent calendars are super easy to make…but we all know that the anticipation of opening each box or envelope is where the real fun begins! 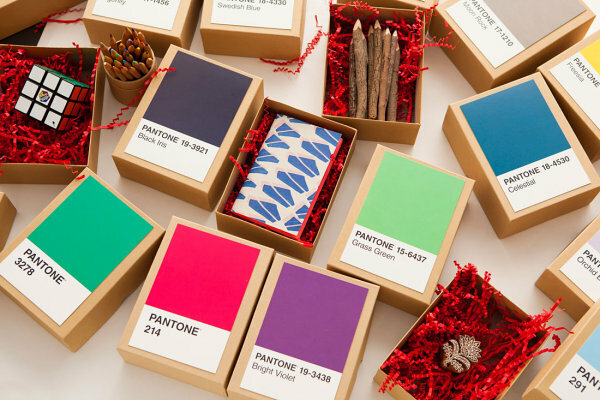 This DIY Pantone Advent Calendar from Brit + Co. cleverly incorporates gift boxes, Pantone postcards, crinkle paper and goodies into one beautiful finished product. 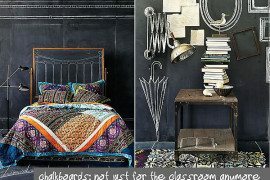 Using Pantone cards is an excellent choice, but we also think paint sample chips would work just as well. Your kiddos will love selecting paint card colors at the home improvement store, then gluing them to the boxes once you return home. 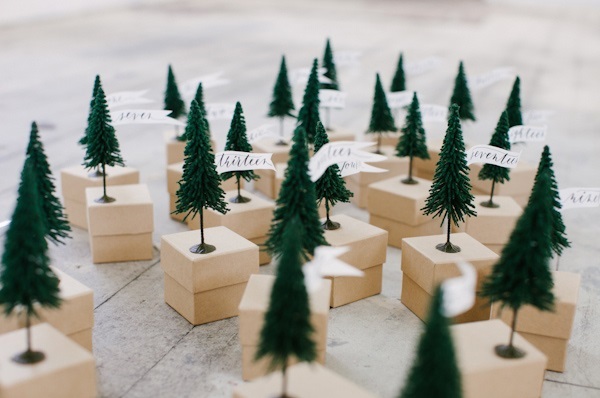 How fabulous is this next DIY advent calendar idea?! 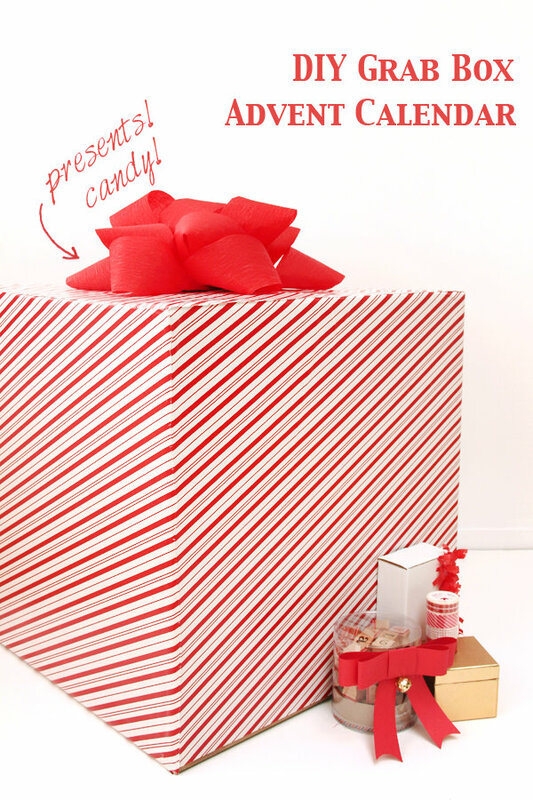 It’s a DIY Grab Box Advent Calendar from Studio DIY, created by wrapping a cardboard box, cutting a hole in the top, and then filling the box with treats. While you will be the one to cut the hole and tend to the filling duties, let the kids be involved in wrapping and/or decorating the box. Then let them retrieve one treat each day by reaching into the box through the hole at the top! 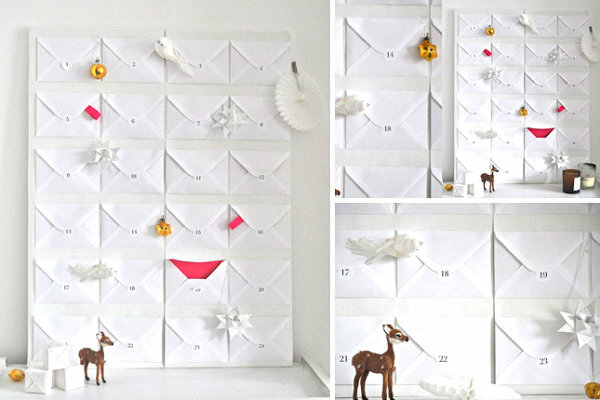 Next we showcase advent calendars that are made with the help of envelopes. Or envelope-like favor bags! This DIY Instagram Advent Calendar from Studio DIY utilizes the services of Stickygram, who turns Instagram photos to magnets. 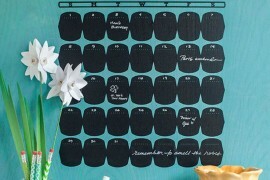 While you may choose to fill this calendar with items other than photo magnets, make sure your treats of choice can fit into a white favor bag folded envelope-style. Cover each envelope with a bow–or better yet, have your kiddos be the ones to apply the gift bows. Don’t forget the twine, which helps suspend your finished product while keeping everything together! 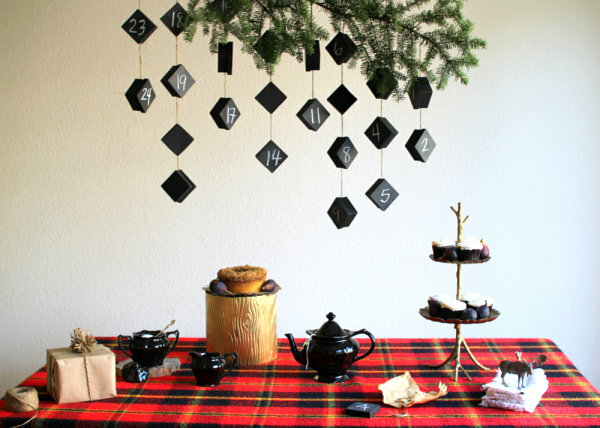 Our last batch of DIY advent calendars showcases unconventional uses for everyday objects. Like tiny socks! 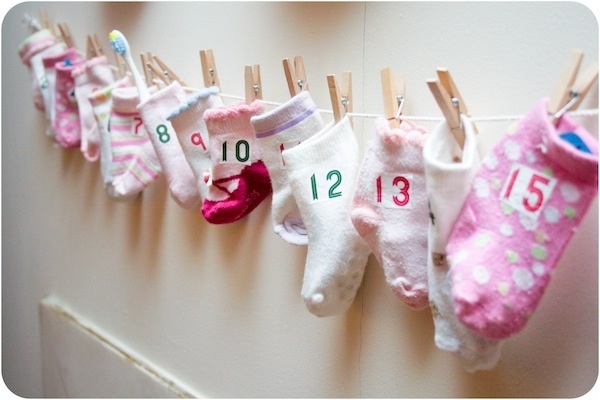 This DIY Baby Sock Advent Calendar from Blog a la Cart is super easy and oh so fun to make. 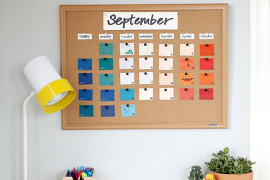 Use your children’s old socks as the basis for the calendar, adding number stickers to note the calendar days. Have the kids help you clip the socks to a twine clothesline before you stuff each selection with treats. 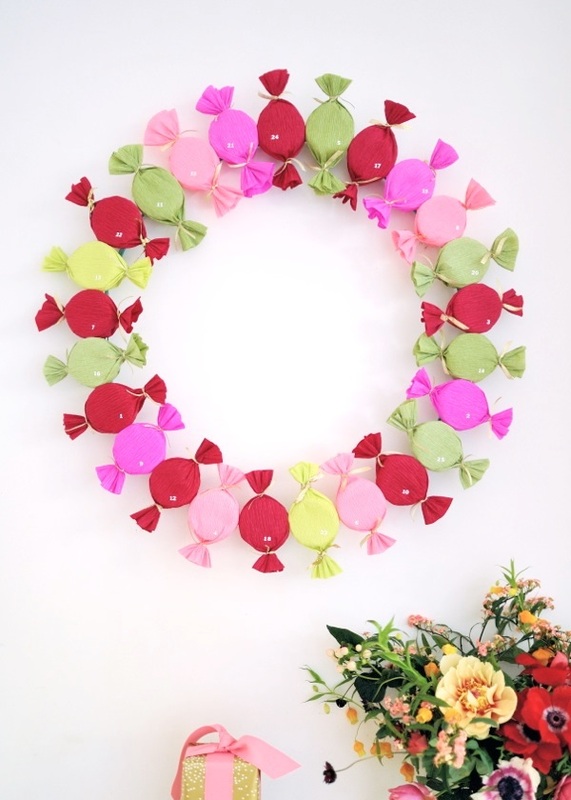 Those little plastic containers that hold condiments and small food items are the basis for this Bonbon Advent Wreath from Oh Happy Day. Simply wrap the containers in crepe paper squares and secure the ends with gold ribbon. Don’t forget the sticker numbers! Let the kids help you bunch and secure the ends of each “candy” while you tie the bows. 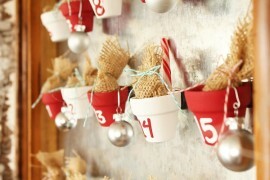 Our last featured calendar features ornaments and tags pinned to a burlap-covered board. While the kids may not be as involved in the creation of this DIY Advent Calendar Pinboard by Andrew & Amanda LeJeune, they will love adding the ornaments to your tree one day at a time! As you prepare your advent calendar, remember that you are the one who will be filling each container. 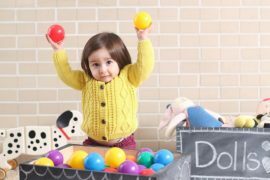 Your kids can help with the decorating, but you’ll want the treats to remain a surprise until it’s time to reveal them each day. 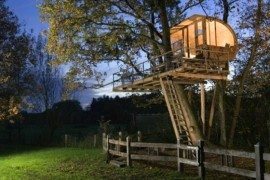 We at Decoist wish you and your family a Happy Holiday!